And the winner is... we don't know yet for sure, but this is the lead contender so far. By far. Voting continues, however. Recovering from the loss of the Monday through Friday fan favorite Are You Being Served?, it looks like Rhode Island PBS will be offering As Time Goes By in the 7:30 p.m. time slot. If so, As Time Goes By will begin at the very beginning, with the first episode of the first series. As of September 12, 2013, the owners of the broadcast rights for Are You Being Served? have come to their senses and agreed to license PBS stations again. So, we're back to our regular schedule... the staff at Grace Brothers will tickle your knickers for the foreseeable future Monday through Friday at 7:30 p.m. 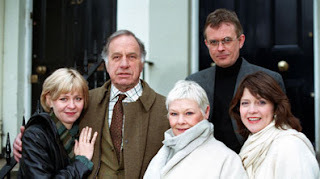 Sometimes the art of making a successful sitcom looks effortless and with both its tight scripts and the starring talents of Judi Dench and Geoffrey Palmer, As Time Goes By is a fine example. Their two characters: Jean and Lionel, fell in love during the early 1950s, but when army officer Lionel was sent to Korea they lost touch after a letter he sent her never arrived. Both assumed the other had lost interest, but 38 years later their paths cross again, when Lionel returns to England to write his memoirs of life in the army and as a coffee-planter in Kenya (imaginatively titled 'My Life in Kenya'). Seeking an agency temp to handle the typing, he is sent a young secretary in the form of Judith Pargetter and after hitting it off they agree to meet for dinner. That evening, though, Lionel also chances upon meeting her mother and his long-lost sweetheart: Jean. But could their love be rekindled after so long? Across nine series, audiences followed their complicated relationships as other admirers vied for Jean and Lionel's affections (including double-divorcee Judith's crush on Lionel, and his smooth agent Alistair's fondness for Jean). Eventually, though, Judith and Alistair fall in love and the path is cleared for Lionel and Jean to get back together and marry, although their strong characters and colorful past ensured there was always something for them to fret about and for viewers to laugh at. The finely judged scripts were penned by Bob Larbey, who'd co-written The Good Life as well as another romantic sitcom with Judi Dench (A Fine Romance) and although its gentle brand of middle-class humor wasn't a cross-generational hit, As Time Goes By maintained a strong popularity and even occasionally contained edgier story lines that belied its twee image. Perhaps surprisingly, the show also achieved the notoriously difficult feat of 'breaking' America, where Judi Dench (despite her string of high-profile film roles) became best known as Jean. After the last series ended in 2002, viewers were given the chance to catch up with their beloved characters over a two-part special in 2005, which neatly rounded off the story with a characteristic and satisfying polish. Farewell Tribute to "Are You Being Served?"